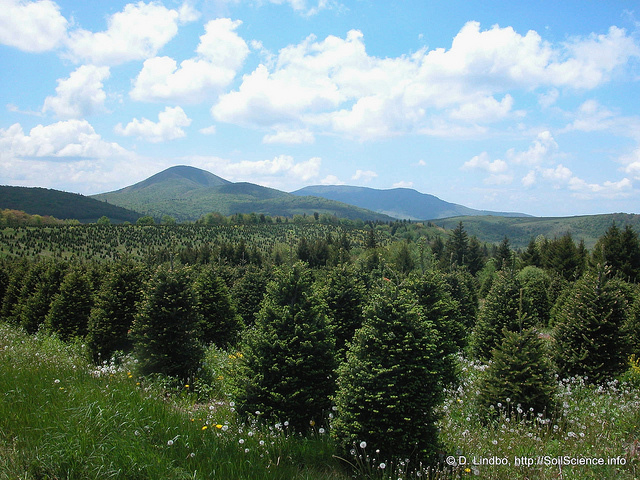 The production of Fraser Fir Christmas trees is a major part of the economy in the mountains of North Carolina; photo by Soil Science @ NC State on Flickr (use permitted with attribution). North Carolina designated the Fraser Fir (Abies fraseri) as the official state Christmas tree in 2005 as a result of the hard work of 8th-grade students at Harris Middle School in Spruce Pine, NC, who researched the economic impact of the Fraser Fir industry on the state and suggested naming the Fraser fir species as a new state symbol. The Fraser fir, native to the Appalachian Mountains, can take as long as 12 years to grow to retail Christmas tree height (6-7 feet). The Fraser fir has been chosen ten times since 1971 as the White House Christmas tree, and constitutes more than 90 percent of Christmas tree production in North Carolina. The Fraser fir is named after John Fraser, a Scottish botanist who explored the Appalachian Mountains in the 1700's. Fraser firs can reach a height of 80 feet with trunks as large as 18 inches in diameter.